that is the sound of a drive by blogging. still really busy, but i cannot resist a quick little update. and i have to post my next Fall Into Autumn topic! 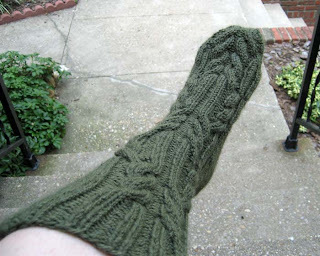 thank you for all of the nice comments on my Log Cabin Sock. i have not been knitting long, but i try really hard to make my stuff look better than my duration of experience would suggest. i'm glad to see that is working! i think my cables turn out pretty nice because i taught myself to cable early on in the adventure of learning to knit. since the first (unfinished still) cabled scarf, i have made fetching from knitty.com and the cabled neck tube from helloyarn. i say i don't like cables, but i really enjoy how they look. i just don't particularly like making them. Autumn has now officially begun here in the States!! What is your favorite thing about Autumn/Fall? Why? my favourite thing about this time of year is the weather change. as much as i like summer, i prefer the cooler temperatures. i like to dress in layers, and i love to wear scarves and hats (both fashion accessories like silk scarves and newsboy caps as well as the warmer hand knit/crocheted varieties) with my outfits. 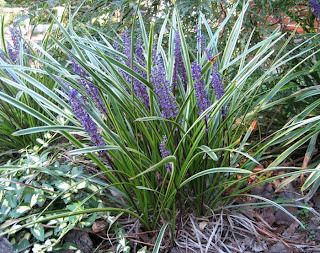 i also enjoy the look of fall--the leaves, fall flowers, and the quality of the sunshine. there is something about the angle of the sun once we reach fall that really appeals to me. it also seems to me like the wildlife gets more active during the fall. the squirrels and birds are out and about busying themselves with winter preparations after being less active in the summer heat. 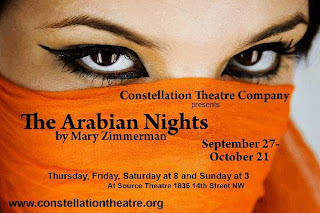 fall is also exciting because it is the return of the live theatre season. i work a lot in the summer, but the new season beings to unroll beginning in september and it has a new energy that the last shows being dragged out in the summer lack. there is something about being in either a freezing (from AC) theatre or a sweltering theatre (lack of AC) that makes me long for the fall. i keep trying to start an entry, but then i stop because i am too tired or what i am writing about doesn't seem that important. or i would rather be knitting a sock than typing. i've been working a lot to get my show up on its feet. evenings in the theatre, weekend chained to a sewing machine. even a costume design emergency. maybe i'll talk about that later. i started another sock. yeah, yeah, yeah... southwestern socks are still sitting there, but at least the new pair is a holiday gift. i'm knitting the Log Cabin Socks from Handknit Holidays. they are really easy and pretty fun. i get tired of cables sort of fast so i am starting early enough to be sure they get done by christmas. these socks go so quickly (they are knit in a worsted weight yarn) that i'm sure i won't have trouble getting them done. 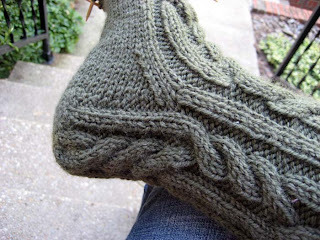 i have about an inch more to go in the cable pattern on the instep before i start the toe decreases. these will be going on a male foot, and i hope i get the size right. i'm actually more concerned about making them too big--not too small! we'll see. this recipient is very "free" with his size opinions. southwestern socks might be taking a longish break because i have a lot of holiday gifts ahead of me. i've taken care of all of my girlfriends whom i knit for, and i am pretty far along for my father. a couple gentleman friends still need presents and i have not settled on any of the projects i'm making for my mum. way to put things off! to be fair, some of what i have put off are my crochet projects because i know i am fast with crochet, and i can crack out those presents very quickly (two hats and a toy). don't fret about me working at a LYS. i am easily amused by yarn and pretty things made for me. i am excited that you are getting to come to DC and enjoy the beautiful fall we are having. i hope it stays pretty for you! remember when i said little posting because i am busy? well, posting my topic of the week reply for the Fall Into Autumn swap means a chance for a cool prize. so i make exceptions. a cool prize if worth the ten minutes of sleep i won't get. When you knit or crochet dishcloths, washcloths or face cloths, what do you use? What size needle or hook? Wood? what type? Metal? Plastic? A specific Brand? Why do you love that needle or hook so much? Is there one you are dying to try? 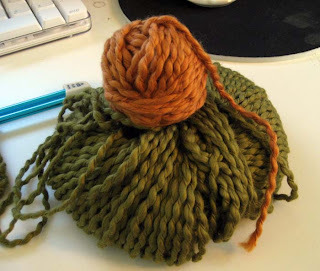 Is there a particular yarn you love and use all the time for cloths? What is so special about it? I must be the least fussy needlework enthusiast in the world. i just use what i have on hand when it comes to needles and hooks. i have several sets of inexpensive crochet hooks (acrylic and metal) and i use those in an "H" or "I" typically. for knitted cloths i use a handy interchangeable circular set in a size US 7 or 8. i also have cheap straights in those sizes that i am willing to use if i have my circulars in a project. i knit the two cloths for my pal on my stupid Susan Bates aluminum size 8 needles. i like Peaches and Cream yarn for dish cloths. i only use Sugar and Cream if they have a color i Must Have. it just is too rough. peaches isn't a lot better, but it is enough better that i prefer it. since i work at my LYS, i'll buy fancy stuff for gifts and face cloths. i am very excited about the cloths i knit for my pal. they were made with very yummy Karabella Windy. oooh. fancy. fancier than i would make for me! 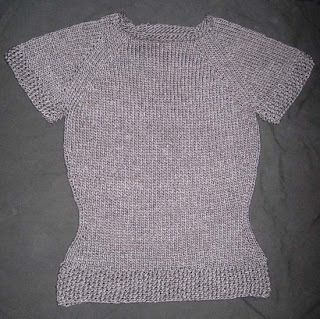 now that i think about it, i knit a sweater for my friends' little boy out of Sweaterkits CottonLiscious , and i think i would like to try that for cloths. see how it holds up for the long haul. it is a lot like Mission Falls 1824 Cotton, and i really enjoyed working with it. who really needs to use their fingers that much? we have thumbs for all the important stuff. i'm a fan of mittens. i think they keep your hands warmer than gloves because you get a nice pocket of warm air around your frosty digits. i also think that mittens are a great cover over a pair of gloves--especially for playing in the snow. get your mittens soaked and peel them off to still have warm gloves inside. yay. i knit this mitten (his mate is on hold until november) for a class i will be teaching at the store. i have three: Crochet for Knitters, Glove and Mitten Fundamentals, Beginning Crochet. fun! back to my non-work life. sorta. 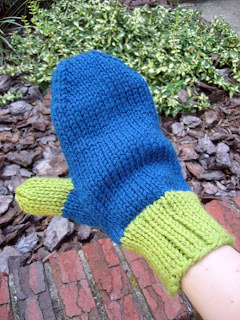 the sample mitten trumped any sock knitting aspirations i had for the weekend. i took my 2nd southwestern sock to work with me friday, started the mitten, and the sock hasn't come out to play since. i have been busy. worked the store and finished the mitten friday night when i got home. recovered for a couple hours. my awesome cast stole all my energy. had dinner at Mandalay with thehairyape. in was awesome. we walked over because it was such a beautiful evening. once there i had a mango and pomegranate martini and a different tofu dish i hadn't tried before. we also ran into the fantastic gwendo calrissian enjoying the cool weather and spicy food. probably very little knitting for the next few days. i have costumes that need to be altered. i also really have the urge to cook. i may do a big "stock up" and put things in the freezer. i think i am making veggie chili tonight. it is a cool day and that sounds really good to me. 1. i had the best night last night. my friend AP and i have been trying to get together for over a month now, and last night we finally made it happen. he took me to Raku in dupont, which i had never been to for reasons that are now mysterious to me. i had sushi. he had noodley goodness. it was good, but i think i like Uni's veg sushi platter a bit better. now.... i have sub points on my great night. at raku i had a strange chick staring at me like i was the devil before her very eyes. or my face had gone green. come to find out, AP had dated said gal in like... 2004. she thought we were on a date. ha. psycho. we also had coffee and listened to the brass combo that plays in dupont. they were hot last night. i love the way music brings people together. young and old, all shades of the fleshtone rainbow, business suits and clubbing dresses... dancing. it was really cool. when we decided we had seen enough and walked on, AP led me right through the center of it, and it was awesome. you could just feel the energy around you amp up as you entered the fray. the weather rocked. i got to wear a sweater and jeans for the first time this season while we were eating outside. 2. i love etsy. i love buying yarn off etsy. i really want to buy some chunky art yarn for a hat, but i refuse to buy it from anyone who styles themself as Moustache Ride Yarns. i draw the line rightthere. 3. the new knitty is out! this time i am pleased, not disappointed. i want to make the urchin hat. i am also a big fan of the seed stitch hoodie and the lace throw. cover shawl is pretty too. yum yum. 4.hi Swap Pal! you get your own number this fine friday. as you asked about my affiliation with the Catholic University of America (link under 'work' in the side bar) in the comments. i will offer an explanation. i design costumes for the theatre as my "job". CUA hires professionals to design their theatre shows. they hired me last winter, and i will be doing a show for them again this spring. so they land in the work pile. i like to give a little nod to the folks who make sure i have food on the table and yarn on the needles. 5. Swap Pal also commented on my lack of understanding myspace. we share that confusion. maybe i don't get it because it is so loud, disorganized, and usually unattractive in appearance that my brain can't handle it and i overload. it offends my design sensibilities. i also don't like being stalked by people i meet randomly, and that has happened too. boo myspace. 6. my ravelry position. i check it about twice a week. people who check in twice an hour need to get a life. yes, i judge. not really. to each their own. 9009 people are ahead of you in line. 11199 people are behind you in line. 7. i have started working the gusset on my southwestern socks. and both windy washcloths are done. 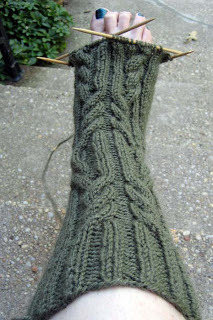 pictures of sock progress soon. remember me? soon i will have a friend! i had an interesting blog-related experience in my real life today. i'm sure everyone eventually has this happen, but it was new to me. one of the cast members of my current show interjected in conversation "hey, i like your blog." i kinda didn't know what to say because 1. i'm not related to this person. 2. he is a brand new friend, so i have not told him i have a blog myself. 3. this is the first time a guy has ever said something positive about my blog. now, i started the blog for close real life friends and family to keep track of what i'm up to and see that i am, in fact, alive and well and knitting in paris. (i wish. couldn't resist a theatre joke.) and i only usually tell people about the blog if they are my knitting friends. they have a similar addiction, so we can't judge each other. other pals who find out... fine. and they usually won't tease because... well... they found the blog. no one wants to tease someone (right away) whom they have taken enough interest in to find the blog thereof. and the last bit about a guy saying nice things about a (bright pink) blog mostly devoted to knitting.... well... as, i said K. is a new acquaintance, and he seems like a pretty good guy. his mother probably raised him right. now, in other work-related nonsense. i was driving home from his design run tonight and got stuck behind a truck with a bumper sticker that was confusing. i understood it but as i followed it for block after, block, i kept think "what is the point?" It's cheaper to yank your own. maybe the only point is that ray, in fact, really is crazy. i need to stop now because i am using to many parenthetical phrases. there are a lot of them in the text of my current show. now they are gumming up my brain. when we last left our heroine, she was in a knitting schlump. that has improved somewhat because the Fall Into Autumn Swap has started, and that is exciting. in fact i marched right out and bought the yarn i will make my pal's cloths from. yes, cloths. i decided i am making two for her. you see, i am very excited about the fact that my pal uses both face and dishcloths. i like face cloths too, so i am making her some. they can be fancier and use smooshier cotton. the smooshier cotton is the other motivating factor. my pal doesn't have a LYS so she doesn't get to pet the good yarn like i do because i work at my LYS. aren't the colors great? the yarn is Karabella Windy. there is only a tiny ball of the butterscotch color because i knit the first cloth last night while talking to my friend B.
so all this talk of my new pal i get to spoil.... well, i am someone's new pal too. hi new friend! thanks for dropping by and leaving a comment. i'll try to keep the content coming! i'm about to run headlong into a busy spell. i have a design run tonight, fittings for the next show all weekend, drawings for a show in december that need to be worked on this weekend and tech week staring me in the face. i also managed to commit to a few social obligations here and there. Now that in some geographic locations the weather is starting to turn cooler, do you change the type of yarn(s) you knit/crochet with? If so, what do you now knit/crochet with instead and why? If not, why do you not switch and what do you knit/crochet with? i knit or crochet whatever i want whenever i want. i crocheted a cotton shawl while it was snowing out and i also completed an afghan during july and august. i think i don't change with the seasons because i don't get overheated all that often, and when i do, i'm not going to knit anyway. i guess i change the tiniest bit when the holidays are coming because i tend to make my heaviest items for gifts during the cold weather. but is tarted my holiday gifts in august, so that doesn't have a lot to do with temperature at time of creation. i think it also makes a difference that i am an equal opportunity fiber enthusiast. i like my cotton as much as my wools, but i don't get to do as much wool as some. many of my projects are gifts, and the majority of my close friends and some family can't wear animal fibers. so i use a lot of cotton or the occasional acrylic. i have lots of little things that don't really go together. so let's a have fruit salad blog post. no, no, no. there won't be a cake on the blog every week, but this one is special like S.'s cake last week. my pal D. at work got it for me because she didn't think i was working last week on my birthday. D. is great. she likes pretty, delicious things (and trying new things) and i think she likes sharing her discoveries as much as eating them. i own a previous act of D.'s generosity--a copy of an out-of-print sock pattern booklet from the 1940s calls "2 Needle Socks". i think this should accurately demonstrate the level of D.'s generosity. at least it will to knitters. 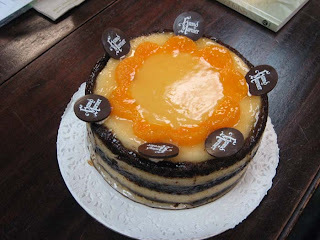 this is a Grande Mariner cake from Stella's Bakery in Rockville, Maryland. it is delicious. you should march out right now and get one. Rosey Grier's Needlepoint for Men. this is a real book. it came out in 1973. for those of you who, like me, were not walking this earth to know... Rosey was a football player in the 1960s. back when they were the Los Angeles Rams. go have a look-see. it is very amusing. i love books from the 70s. there is something about the "hipness" of them that is quaint. 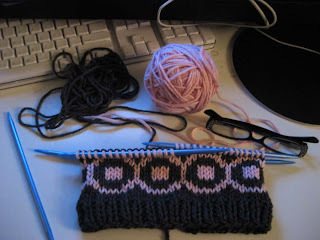 i forgot to mention that i have a knitting profile running on the Knit + Stitch = Bliss blog. have i not mentioned that i am now running the blog for my LYS (and place of employment)? hm. well, i am. yes, i am a professional blogger now. go see my "Meet the Staff" profile here. i have been getting a lot of traffic to the blog from people googling the actors in my last show. i guess all i have to say about that is... hi, guys! but maybe it is wrong to assume they are googling themselves. i do it from time to time to see if i missed show reviews or the like. and i know at least one actor who proudly would tell anyone who would listen that he had 15 pages of listing in google. and that was 2 years ago, so he is probably up to more now. ha. Knit Lit is not a very good book. it should be, but i think the stories have all been edited to not really be stories, but rather those types of moments that you stop sharing and say "well, i guess you had to be there". i think i could also be disappointed because reading about knitting is less fun than doing it. then why are blogs interesting? little to no knitting to report. i've been catching up on other aspects of my life. oh, who am i kidding... my sock is going in fits and starts. i keep eff-ing up the lace pattern by 1. getting cocky. 2. getting distracted. 3. drinking a 2nd beer while knitting.... which i guess is a combination of #1 and #2.
i'm halfway to the heel. maybe i'll have more to report after the weekend. reviews are out for my latest show. the critics were not entirely unkind, but they were very honest about the script itself. 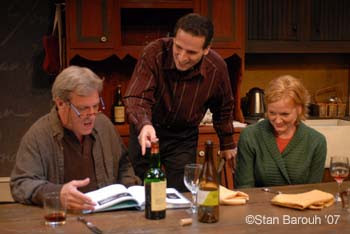 Sight Unseen was Margulies first success, and it is a very young play. 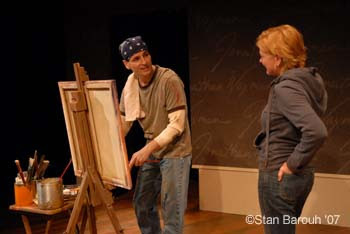 but as Jonathan in the script doth say... "you can't fault the artist for being young." besides, criticizing formerly celebrated works because the playwright has grown and become better seems disingenuous to me. The Baltimore Sun review by Mary Carole McCauley is here. and you can read a review by James Howard here. and here are a few pictures from the show for you to enjoy. all photos by Stan Barouh. it isn't very often i get to say i finished two projects in one 24 hour period and learned something new to boot! today is one of those days. i finished the sweater, cast on for the hat, taught myself to fair isle and finished the hat in one full day. knit in Reynolds Rapture (1 skein #420 Charcoal Grey, 1 skein #244 Pale Pink, 50% silk 50% wool) purchased at Knit + Stitch = Bliss on size US 10 double points. this was a fun little knit, and as you can see in the photo to the right i now think i am a badass because i managed my first fair isle project. yes, that is my badass face. 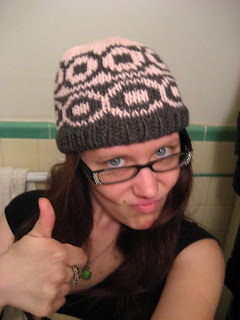 if i knit this again, i will probably make a few small changes. 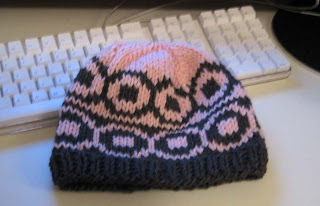 i think i would knit a few more rows of ribbing and extend the center of the pattern by knitting two grey rows and two pink rows before continuing the circle/square chart (instead of one each). i think i just like my hats a tiny bit longer. changes i did make... rather than placing my paired decreases directly beside each other, i spaced them on either side of the marker. it just looks a little prettier that way. i also decreased a little less before tying off the center live stitches. i didn't want to get a pointy top to my hat. i still have 2 full skeins of grey and 1 full skein of pink. hm. i may try to make something to go with these, but i'm not much for matchy sets. so they may just end up hanging out in the stash for a little while. we'll see! i couldn't sleep last night, so i decided to teach myself how to fair isle. i don't know if i am doing it correctly, but it looks pretty good, and i don't have holes. we'll see how my floats stretch when i can finally try this baby on. and, yes... this is the leftover sweater yarn plus the pink i bought as a back up plan if i had run out on the sweater. it looks like the hat won't even eat up what i have left. we'll see... maybe mittens? i finished it! the sweater would have been finished last night, but my energy went downhill at midnight. i left 3 rows of sleeve knitting and the end-weaving to today. but here it is! knit in Reynolds Rapture (6 skeins #420 Charcoal Grey, 50% silk 50% wool) purchased at Knit + Stitch = Bliss on size US 10 circular and double point needles. this was a fun little project. it kept me busy and out of trouble while i was in tech for the show Sight Unseen, which is part of where the name comes from. the other part of the name's origin is the fact that i knit at least half of this thing in the dark. it is a super easy project and would make great TV knitting. also, with so little finishing, you could practically cast off and wear it if you weave your ends as you go along. 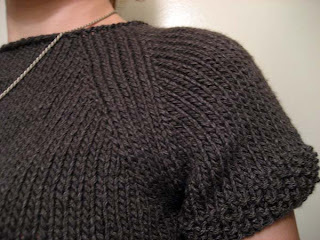 if you understand the construction of a top-down raglan sweater, you can easily modify to size this baby up. as it is, you can customize the length by trying it on as you go and adjusting length or adjusting the increases (both in number and position). i took the second photo without a flash. yes, really. the silk in the yarn really throws the light! yowza. i really loved this yarn, and i am pleased to report that i still have two skeins of the grey and two skeins of pink. i think something fun will be happening to those little darlings soon. but with all the leftover yarn... can you believe i knit a whole sweater (yes, short sleeved) out of less than 450 yards yarn? i'm shocked. i knit a sweater with roughly the same number of yards as a sock. i know it is a chunkier yarn, but sheesh. ps- this is my first sweater design. and technically it is the first adult-sized sweater i have knit. go me. i joined my first swap today. i'm starting small and doing a dishcloth swap. registration goes through September 8 over here. we get partners after that! weeeee! 1. Do you knit or crochet? How long have you been doing it? I do both. I have crocheted for about 5 years, and I have been knitting for a little more than 7 months. 2. Have you made dishcloths before? Do you use them yourself, give them as gifts, or both? i have made them before, and i mostly make them as gifts. those that i own and use are gifts from others to me! 4. If you knit, do you prefer circular or straight needles? For all, do you prefer wooden, metal, or plastic needles? i knit on metal interchangeable circular needles and wooden double points. i crochet with metal, but i hate addi turbo crochet hooks. 5. What are your favorite colors? Any colors you don't like much? depends on the project.... i like greys, black, deep reds, raisin, and pinks for clothing and accessories. i love crazy colors for socks and wash cloths. not a big fan of blues or lighter purples, and i actively dislike pastels. 6. What do you like best about Autumn? the crisp air, the way it smells, and the leaves. i also like dressing in layers but not being snowed on! so it is the perfect time of year. 7. Pies: Pumpkin? Apple? Pecan? All of em? or No Thanks! hm. pumpkin or pecan. but only a little bit. 8. When you were a kid, were you the one who couldn't wait to get started with school, or the one who overslept on the 1st day? i always liked school, but i was usually nervous about starting up again. 9. Do you celebrate Halloween? (The real key here guys is especially knowing if you have an aversion to the holiday or little goodies/decorations associated with it, given the timeframe of the swap) i like halloween, but i don't really do anything with it. (costumes are my job, so why would i do one for "fun"?) i'm not a huge fan of seasonal decor, but i love skulls all year round. 10. If you had to choose just 3 edible 'goodies' to eat for a full year, what 3 would you choose? deluxe mixed nuts, sorbet, twix. 11. Do you have any pets? Kids? Husbands who seem like kids? ;) none of the above. but i want a kitty desperately. send me one? 13. Do you use your cloths mostly for dishcloths, or as facecloths? i use the fancy ones for my face and more utilitarian ones for dishes. 14. Favorite Fall Holiday: Halloween or Thanksgiving and why? (Feel free to share another fall memory if you do not celebrate either of these holidays) i guess thanksgiving. because i get to take a break and see people i'm not around very often. 15. Do you have any allergies or aversions your pal should know about? i have a boatload of allergies, but here are the pertinent ones.... mohair, angora, bananas, cucumber, apple-flavoured candies. my skin is wacky, so the simpler the soap, the better. last night i went to the opening of my show that is playing in Baltimore. thehairyape joined me, and it was a good time. pretty good opening night show. good audience. and so forth. after the show we had tapas and sangria down the street from the theatre for my birthday. sangria seems to be my Official Birthday Drink. yum. 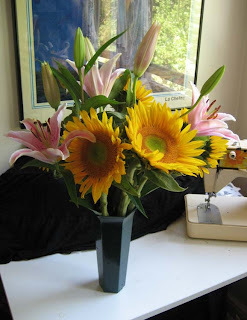 the picture is pink lilies and sunflowers that thehairyape gave me. aren't they pretty? he has good taste in flowers. maybe he should give lessons to the clueless men of the world who buy the same flowers over and over again for their mothers, partners, and female friends. Featuring Deborah Hazlett, Paul Morella, Karen Novack, and Bob Rogerson. Read more about the show here. Or buy your tickets here. i'll post some pictures for your enjoyment soon.